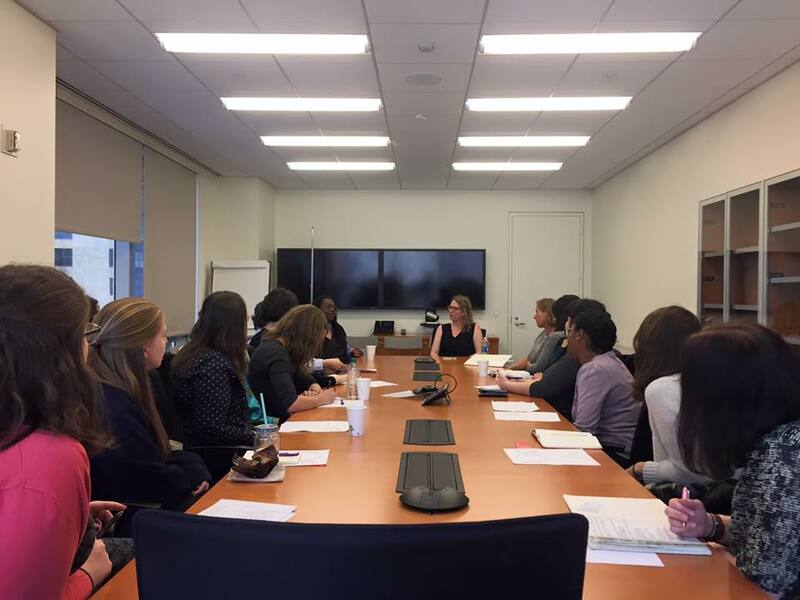 On November 16, 2016, a group of approximately 20 YPG members gathered for a Brown Bag Lunch at Random House for the first installment of the Subsidiary Rights 101 series, focusing on foreign rights. The panelists included Tawanna Sullivan, Associate Director of Foreign Subrights (Penguin Random House), Abigail Koons, Literary Agent and Executive Director of International Rights (Park Literary Agency), and Riky Stock, Director (German Book Office). The panel began with each panelist speaking about her experience in publishing. Koons has been working in the publishing industry for 14 years and participated in a publishing program at NYU, and Sullivan has been in publishing for 20 years and received her master’s degree at Pace University. Stock spoke about her time working at HarperCollins before she moved over to the German Book Office, where she now runs the literary agents’ center at the Frankfurt Book Fair. Koons explained the process of handling foreign rights at an agency. When an agent submits a book to a publisher, they determine which rights they want to retain. If they keep foreign rights, then their co-agents will sell the translation rights to foreign publishers. Co-agents work for the agency and their salary is based on commission. Agencies manage many books and rely on co-agents in different countries to understand foreign markets and know which titles will perform well in each country. Or, in some cases, agencies sell world rights to a US publisher, which then has the ability to sell the translation rights themselves. Sullivan spoke about how publishing companies sell translation rights they’ve acquired. They also have co-agents abroad whom they work with to target foreign publishers. She and Koons discussed the role of scouts, who represent foreign publishers in different countries. Scouts write reports on manuscripts and submit these to publishers, who pay a fee for access to the scouting reports. As a result, scouts get to know a lot of different publishers, so this can be a great entry into foreign rights. Koons and Sullivan talked about some of the benefits of working in foreign rights and skills required for the position. Koons said that she wanted a job that would pay her to travel, which drew her to this field. She also emphasized the importance of maintaining relationships, and said that she gets to meet people from all over the world, which is great for anyone who is interested in learning about other cultures and getting acquainted with new people. Sullivan said she doesn’t speak any other languages, but that it can be helpful if you do—however, most business is conducted in English, so it’s not necessary. They clarified that they don’t identify as salespeople because they don’t push every title for every publisher; instead, they really focus on finding the right editor for each book. They also emphasized the importance of understanding different foreign markets, since the popularity of each book will vary based on the country. Sullivan said that she has learned to tweak her pitch for a book depending on the market. Finally, Stock spoke about the Frankfurt Fellowships program, which gives young people working in publishing the opportunity to attend the Frankfurt Book Fair. They generally accept applicants under the age of 40, often editors who are at the forefront of publishing works in translation. They choose applicants from all over the world, and many other book fairs have similar fellowship programs. Stock explained that these fellowships are a great opportunity for young publishing professionals, like YPG members, to attend the Frankfurt Book Fair and explore the field of foreign rights, thanks to the helpful advice from our panelists.